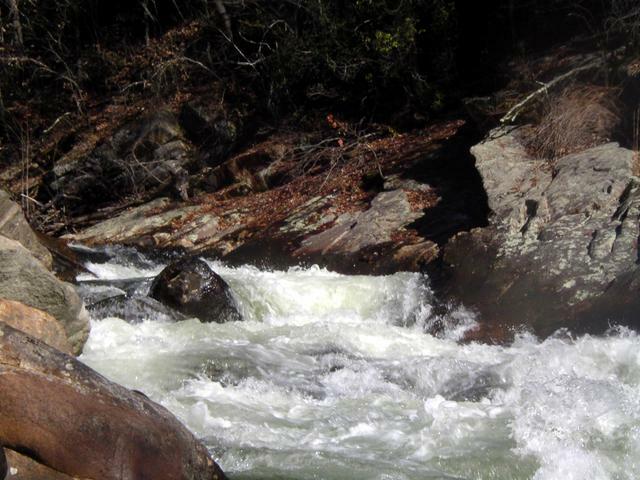 A few comments on the Russell Fork. This is a beautiful river that only runs when there are either un-scheduled releases from the Pound River (Flannagan) Reservior and/or heavy rains, except during the month of October each year there are regularly scheduled releases on Saturday and Sunday when Flannagan Reservior is being pulled down for winter rains. 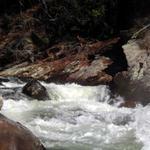 The Upper Russell Fork is nice run with some very technical class 3 thrown in on the lower half of the run. The Upper Russell Fork run during releases normally actually starts out on the Pound river below the Reservior, however it is possible to put in (or take out) just below the confluence with the Russell Fork and on rare occasions when there has been heavy rain its also possible to put in further up the Russell Fork instead at the town of Haysi Va. Normal take-out is at a place called the “Garden Hole”. 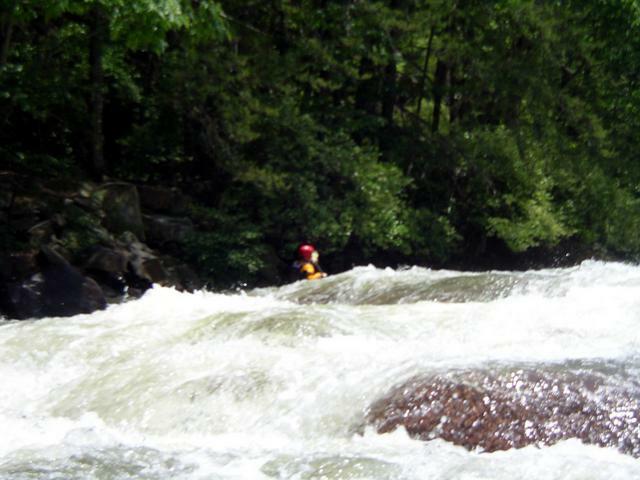 Below the Garden Hole is the Russell Fork Gorge which is an extremely serious run with class 4 to 5+ rapids on it and should only be attempted by those who are seriously ready for it and its risks (only real way out is down river). 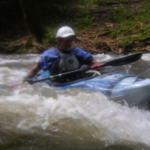 In my directions I will be focusing on the Upper Russell Fork, if you want information on the Lower or Gorge you will need to find that information elsewhere. From Winston-Salem NC area – Go north on NC hyw 52/I-74 and take the I-74 connector to I-77 north on into Va. Stay on I-77 north to Wyethville Va. where I-77 and I-81 combine through Wyethville. West of Wyethville take the I-77 exit to the right going north toward Bluefield Va/WV and Princeton WV. Stay on I-77 north going through the Big Walker Mountain tunnel and on to the East River Tunnel. Imediately after coming out of the East River Tunnel on I-77 take the 1st exit to your right for Hyw 52 (exit #1). This exit curves back around 180 degrees back up to hyw 52, at the end of the exit ramp turn right on to hyw 52 (you should then cross back over I-77). Take hyw 52 to the Va Hyw 460 bypass toward Bluefield and then on toward Tazewell. Continue on Hyw 460 past Tazewell (be aware 460 makes a right turn well past Tazewell (probably 20-30 miles) just before it goes through Ceder Bluff and Richlands. Continue on 460 through Richlands and on to Vansant. As you get into Vansant watch for and make a left turn onto Va. hyw 83. (Be aware hyw 83 after a few miles becomes a very winding and twisting road up, over and back down a mountain pass, but it is a short cut and a quicker route – the road is ok you just need to slow down and be careful). Eventually hyw 83 ends at a “T” intersection with Va hyw 80 at Haysi Va. Turn right on hyw 80 toward Breaks Interstate Park (if you turn left by mistake you imediately go into the town of Haysi). Follow Va hyw 80 (again this is a mountain road – the road is ok, but you must slow down and be careful as it is curvy and winds around and up and down hills and curves). You will eventually come to the entrance for Breaks Intrastate Park to your left as you come up a hill in a staight section of road. Follow the signs to the lodge or camping areas, observe speed limits, and if camping be sure to check-in and pay at the camp office/store on the right out the road to the camping. Upper “The Garden Hole” take-out (put in for lower gorge) from Breaks Intrastate Park – Go back out to the park entrance to Hyw 80 and turn right (toward Haysi) follow hyw 80 and watch for a small dirt/gravel road at an angle (you will be going down hill on 80 when you see it), for the “Garden Hole”, the last time I was there there was a small street sign up for it (Garden Hole Rd.). Turn right onto this road, it is a steep and winding dirt and gravel road. up over the top of the ridge and back down to the parking areas down on the other side. Parking is limited here so try to combine vehicals. Also if it has been very wet weather this can be a tough road to get back up the hill on, in which case try to choose vehicals that can handle this (4-wheel drive perfered). The road has been improved and has been much better in recent years but could still be a problem after heavy rains. Normal put in is at Flannigan Reservior at the outlet pool below the dam. To get there from the Garden Hole take-out, get back on hyw 80 going toward Haysi (away from Breaks Interstate Park). Follow hyw 80 till you come to Va hyw 611 to the right (you can only turn right onto it – this road comes up quickly after a steep curve so watch carefully and be sure to SLOW DOWN to make the turn). Follow hyw 611. Eventually you will come to a place where the road comes alongside the river by a raiload track to a bridge crossing the river. (at this bridge on river right just below the bridge is an alternate put-in and also an alternate take-out for those not wanting to do the more technical parts below of the actually upper Russell Fork) This bridge is just below the confulence of the Pound River and the Russell Fork. Cross the Bridge and continue on hyw 611 until you come to a left turn onto hyw 739 which goes to Flannigan Dam. Follow hwy 739 to the dam and cross the dam, just on the other side take the road to the left, which winds very steeply down the hill (gear down and go slow – steep turns and hill) to the parking lot near the pool just below the dam. Park in designated spaces, unload, change, and take your boats up to the pool at the dam outflow to put in. Alternate put in at the bridge on hyw 611 on the Russell Fork just below its confluence with the Pound river – see as noted in direction #1 above. 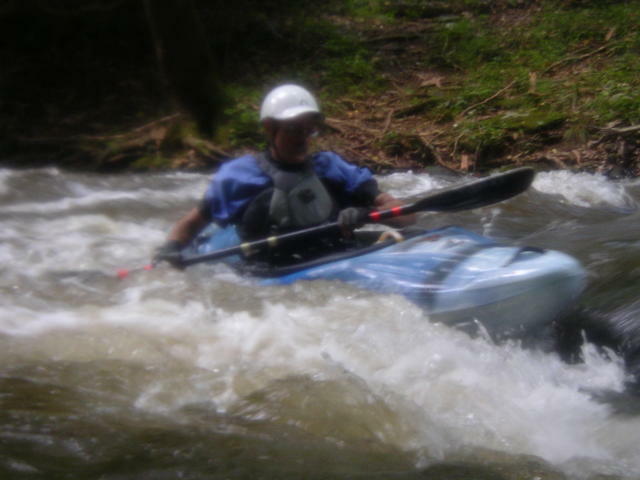 Upper-Upper Russell Fork put in Alternate – to run a section of the Upper Russell fork above the confluence with the Pound (rather than running from Flannigan down the Pound to the Russell Fork). 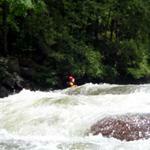 This run requires heavy rains – its natural flow and is not often caught but is a fun alternative when avialable. To get to this put in take hyw 80 into Haysi go through the downtown to the far side of town to on the road along the river. Just past a very small treatment plant to the left on the riverbank there is a gravel parking area to the left along the right bank of the river that can be used as a put-in or you can find an alternate a little further down the road. (did not seem to be any noticable issue from the small treatment plant on a weekend when there was lots of water coming down – its a small town – if your concerned just go a little further down the road). If you run this upper-upper section do be aware there are some river wide ledges in places that can have some serious hydralics, scout make sure where and if to run, most have places to run if levels are in limits.